Frequently I hear ‘orchids are just too sensitive’ or ‘I could never…’, but honestly orchids are not always as difficult as people think. With the number of orchid species estimated at as much as 30,000 species (not a typo, see also Kew: Science and Horticulture: Orchidaceae) and native species found on every continent and climate except Antarctica, plus countless man-made hybrids, finding something right for your house is just about knowing what to look for in an orchid plant. Keeping it alive is just about being well informed (and occasional watering). How is an orchid different? While there are many answers to this question, what really matters to the home grower is that many orchids, and certainly most of the common types grown as houseplants, are epiphytes. This is a situation where the plants use a tree branch (or occasionally rock crevice) as a condominium. They are not parasitic, just opportunistic. What this means to you as the home grower is that orchid roots are accustomed to an environment where while there might be frequent rain, there is also strong air movement. Many types can even be grown on a wood plaque with no media around the roots (see article here). Similarly, if your nicely potted plant has a root sticking out of the pot somewhere you shouldn’t be alarmed – in orchids this is not necessarily cause to repot. Some orchids just don’t really understand the concept of a pot and so throw their roots in every direction. Good watering methods are key to root health. Watering of some houseplants is accomplished by leaving them to sit in water for hours at a time. This is not recommended with orchids (with a couple exceptions of some Phragmipedium species that live on river side rocks) as it may lead to root rot. The easiest thing to do is water the orchid by running plenty of water through the pot from the top. Once the media is well wetted, let it drain, then return it to the window. For best results, orchids are potted in a fluffy or chunky mix that gives a nice balance of holding moisture but allowing air circulation. To maintain root health, repotting your orchids into fresh potting media every one to three years is recommended. Here is a repotting article. Ok, so all that is great, but how to pick an orchid?? The most important piece of advice is to purchase a plant that is well established. You certainly can have success also with that $5 seedling in a two inch pot, but you will likely find it easier with more immediate gratification to buy a plant that is at least within 1-2 years of blooming for the first time. When buying a plant in person, especially at a place like the grocery store, challenge the plant by gently grabbing the leaves and lifting or moving the plant back and forth to see how well it is rooted into that pot. Good roots mean a healthy plant and more likely success. North facing window: Rather weak light. You might be able to grow a Paphiopedilum (Paph) there, or some Phalaenopsis (Phal). If it doesn’t bloom for you, supplement with fluorescent light. East facing window: Great spot for Paphiopedilums and Phalaenopsis. West facing window: Also great spot for Paphiopedilums and Phalaenopsis. Frequently this is also enough light for some Dendrobium (Den or Dend) plants or certain miniature Cattleya (Slc. or Pot.) hybrids, as well as several Oncidium types. South facing window: This is your brightest light, excellent for Cattleya hybrids (Slc., Lc., C., Blc., Pot., Sl., Lc…. ), many Dendrobiums, and Oncidium intergeneric hybrids. If you aren’t sure what category your plant-of-interest falls into, ask the grower for more details. They want you to succeed too! 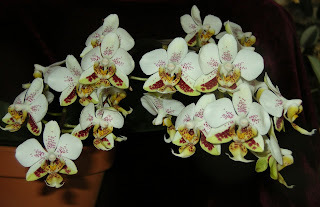 I always recommend if you aren’t sure, go with a Phalaenopsis (Phal.) 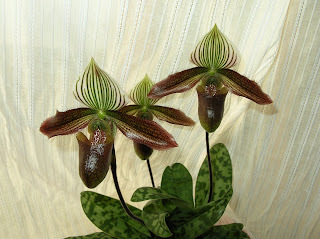 or Paphiopedilum (Paph.). These types are easy to grow, adaptable, and you can always make a very bright window less so by setting the plant back from the glass a little or using a sheer curtain to filter the light. Other culture details are fairly similar for the two types. You can find an article on growing phals here. Thank you for all of the advice! It is most helpful. Orchids are absolutely breathtaking with all of their intricate details.